This week, the inherited and anonymous Rose bush has started its second season of flowering. It’s first season tends to be more pinky before having about 6 weeks off, and this second session (which the camera just couldn’t cope with accurately portraying) is a bright near-fluorescent orange. The mystery Rose bush begins to flower. I’ll need to keep an eye on the Rose as I don’t want it to bring the aphids back, especially as the Sweet Pea ‘Cupani’ have recovered and begin flowering on mass. Today I discovered a secret courgette hiding in amongst some large leaves. It’s really knobbly. Maybe this is down to it having been growing on the plant for too long? I’ll be putting some of my Courgette ‘Black Beauty’ to good use again soon with the discovery of Lemony Courgette Cake (thanks to the Horticultural TV Channel) and to making some more Eden Project Garden Courgette and Tomato Chutney, which my parents have been enjoying. I ‘rebranded it’ as ‘Tomato Chutney’ as my Dad “hates” courgettes, despite enjoying the chutney. Don’t tell him (my mother is in on this). 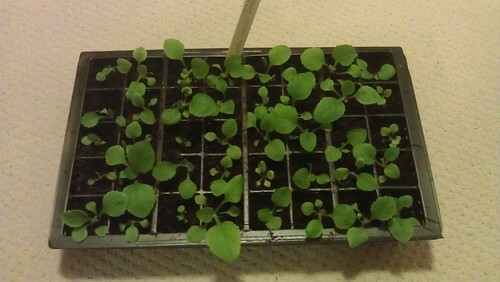 I’ve also been pricking-out the Foxglove ‘Excelsior Hybrids Mixed’ seedlings that I sowed in a tray back in June. In total, there’s about 60 plants now, which can grow on and be potted up again before being planted out for next year’s season. This might seem a bit laborious but when the plants are expensive to buy individually, I’ve essentially got 60 foxglove plants for the price of one – and there’s still a lot more seeds left – I got them from Thompson & Morgan. The bees seem to love them. The Rocket ‘Skyrocket’ is almost at picking stage – which is good news as the hot weather has been creating a salad shortage in my local supermarket. Seeing as I live on salads all year round, having my own crop is great.